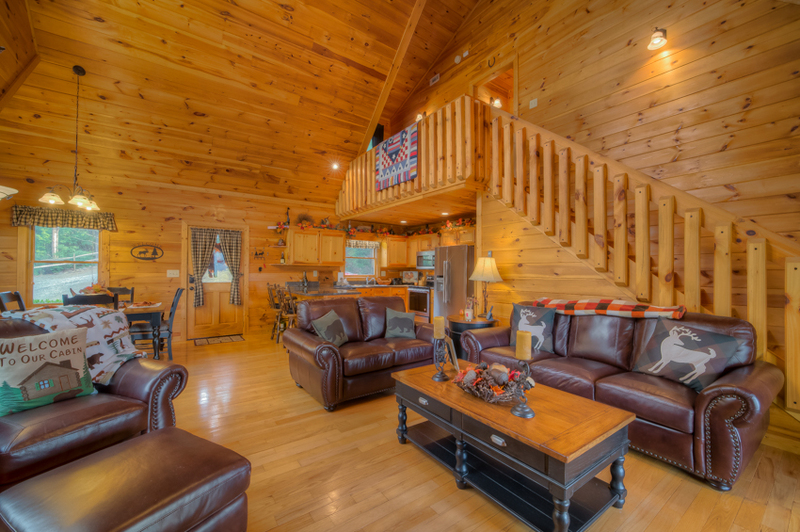 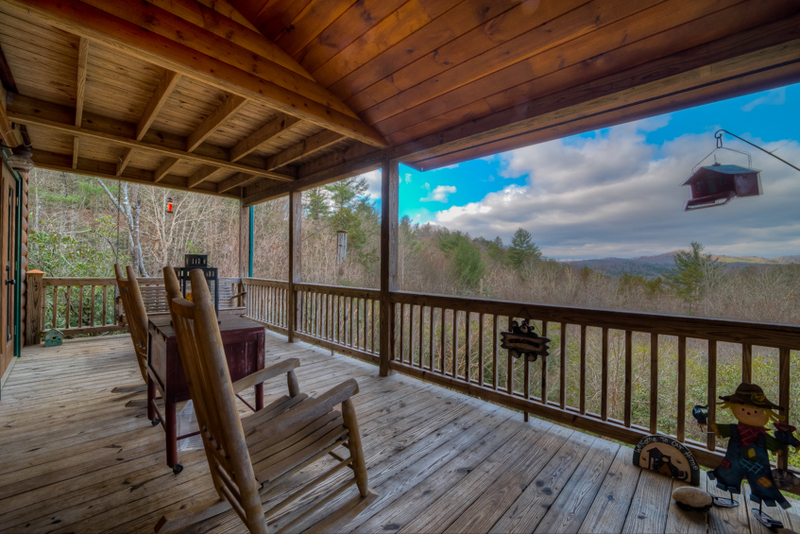 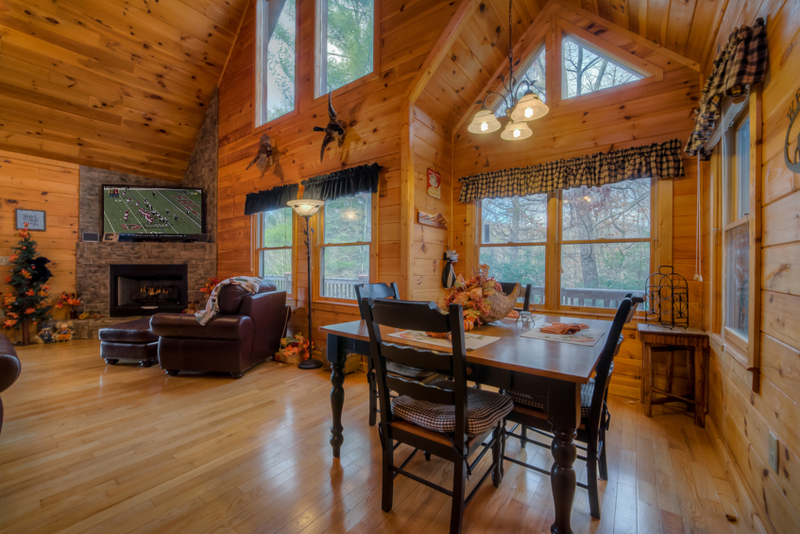 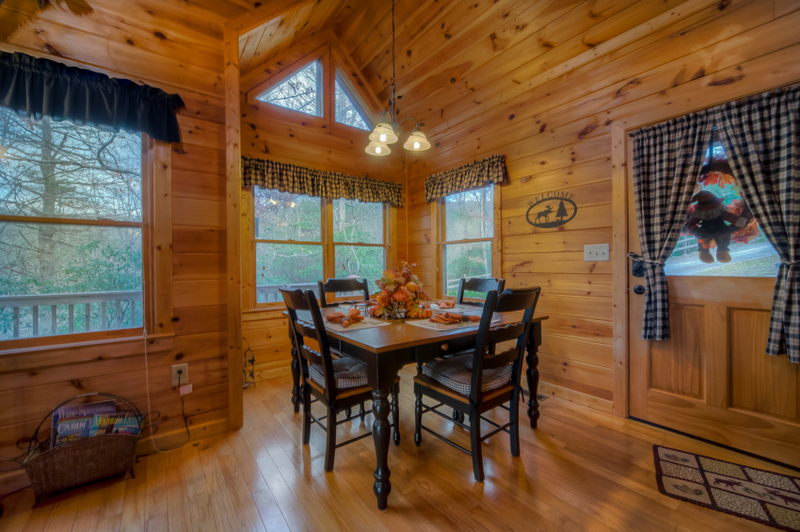 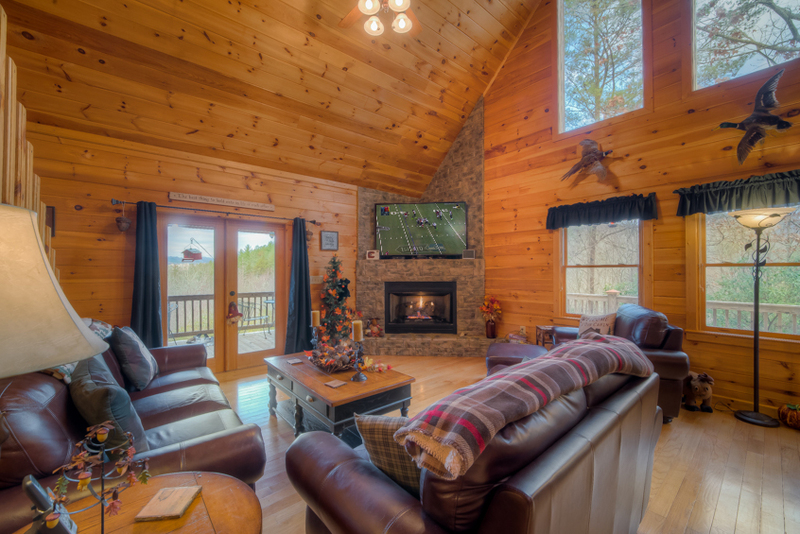 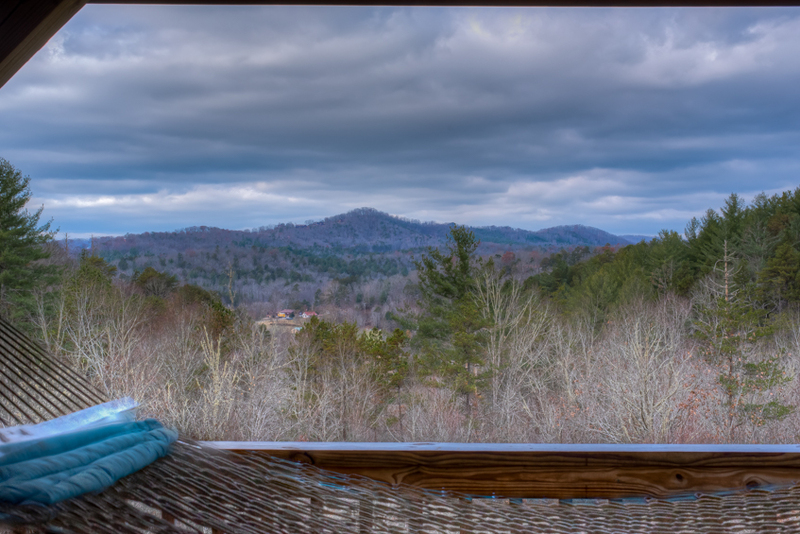 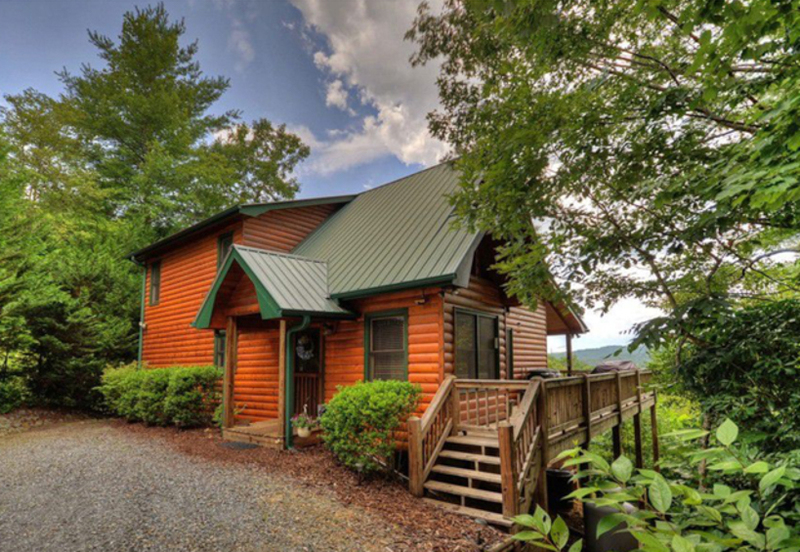 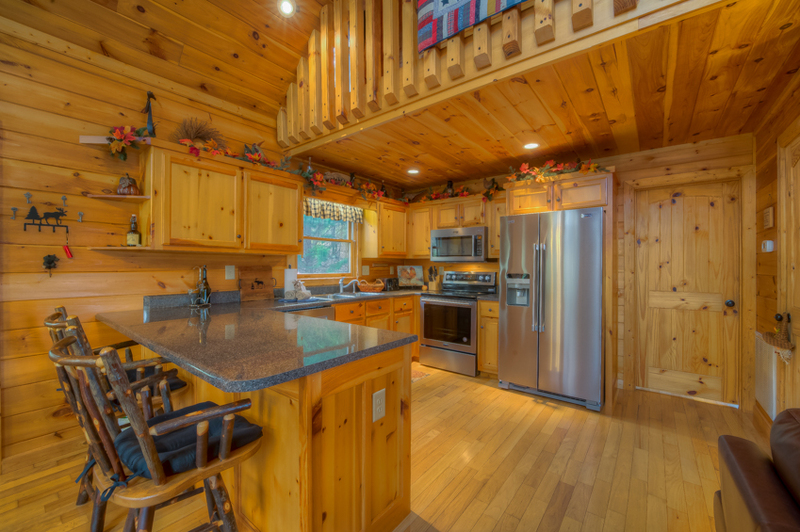 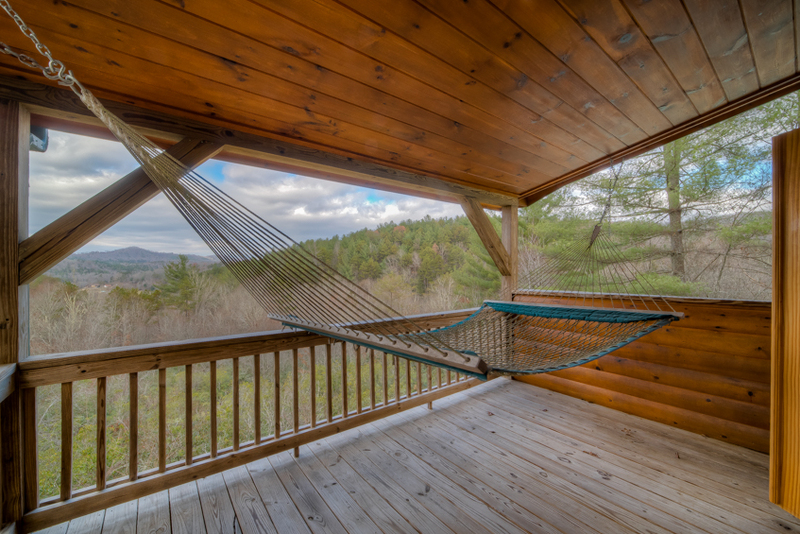 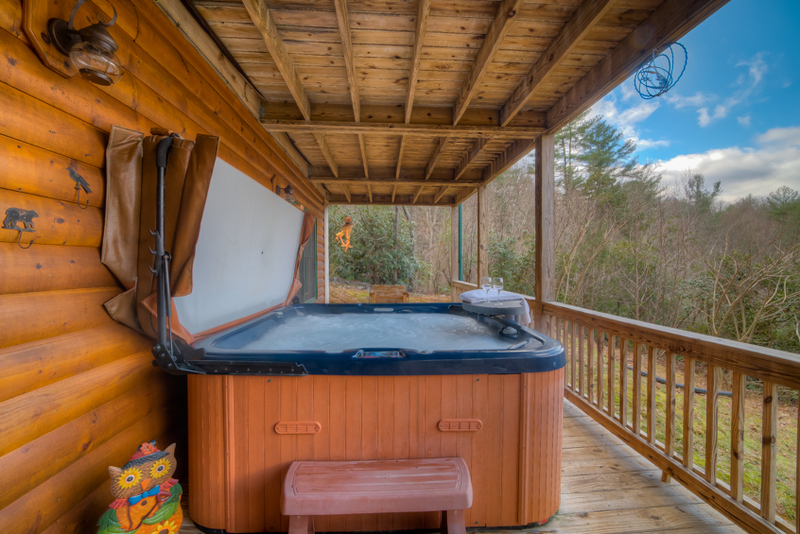 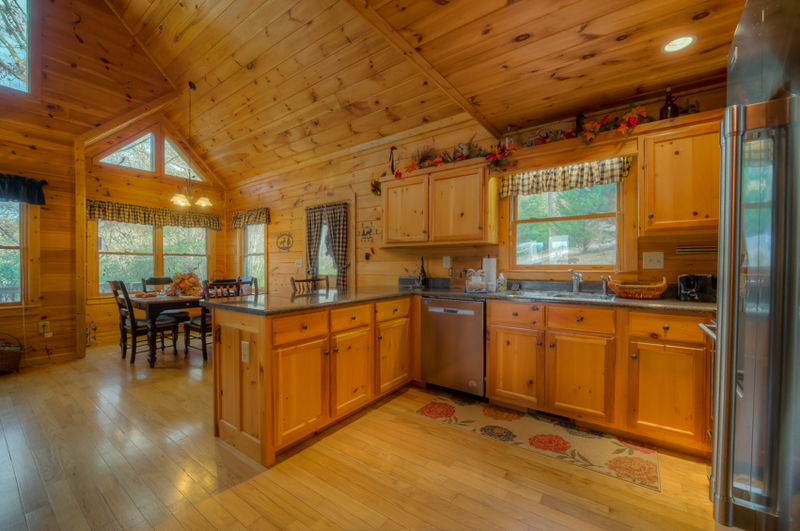 When your busy, stressful lifestyle has you wishing for a Blue Ridge cabin rental getaway that will relax and rejuvenate you, a vacation at Harvest Moon can make those wishes come true. 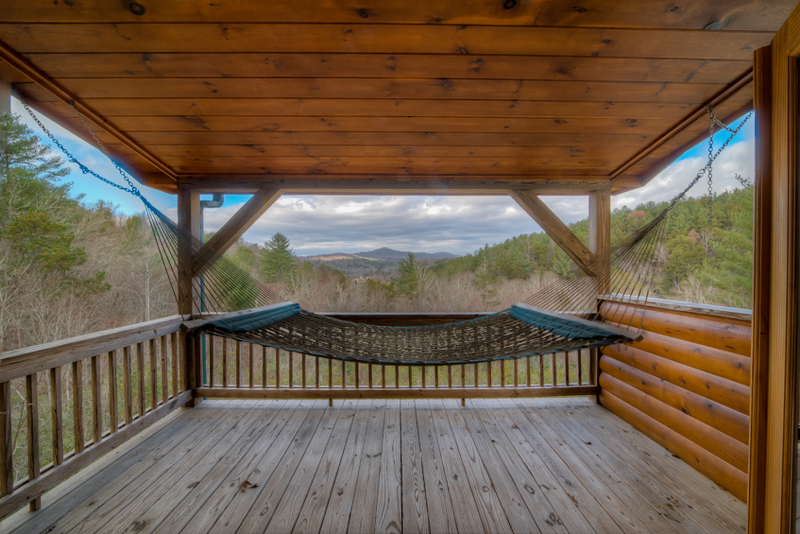 Here, traffic noise has been replaced by the sounds of nature: birds, crickets, and the water flowing in the creek nearby, and fresh, clean mountain air fills your nostrils as you take in the spectacular view of Georgia, North Carolina and Tennessee in the distance. 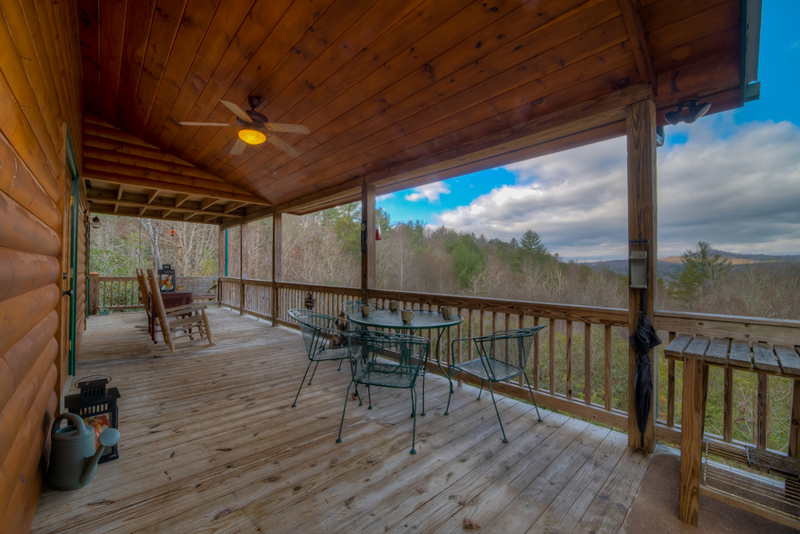 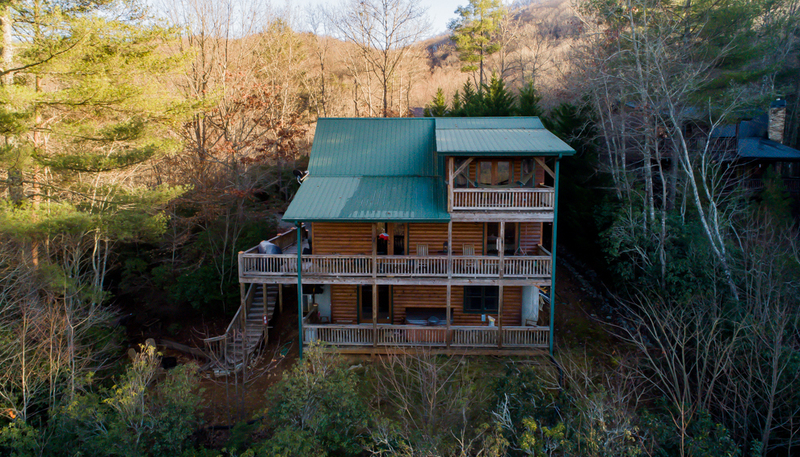 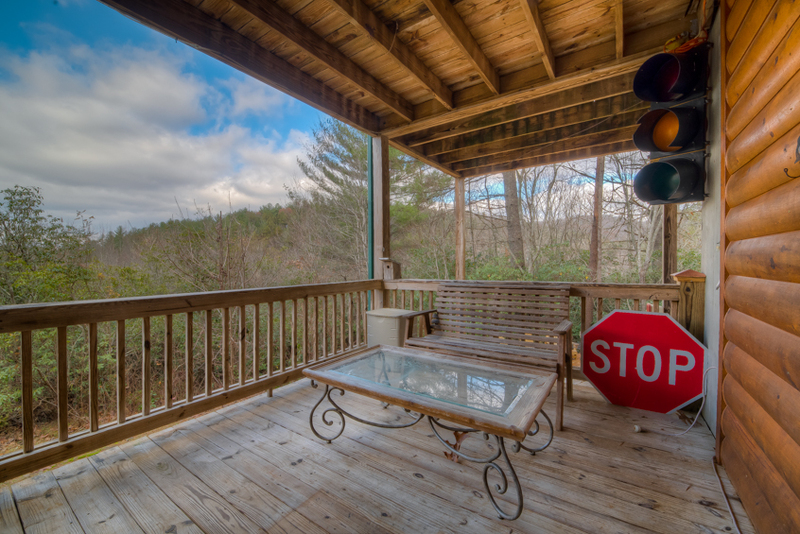 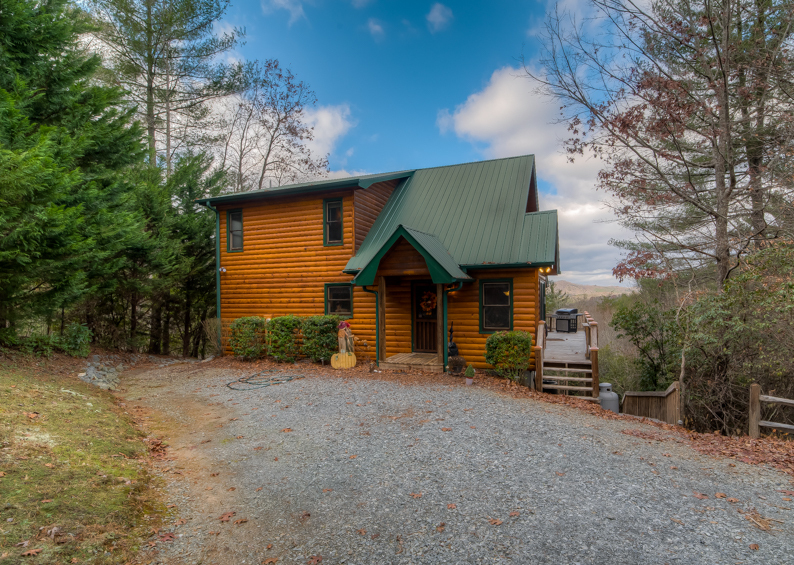 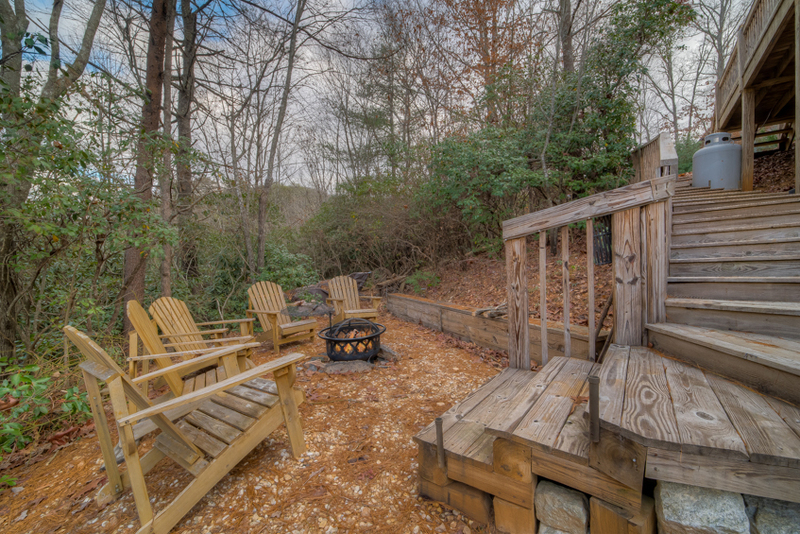 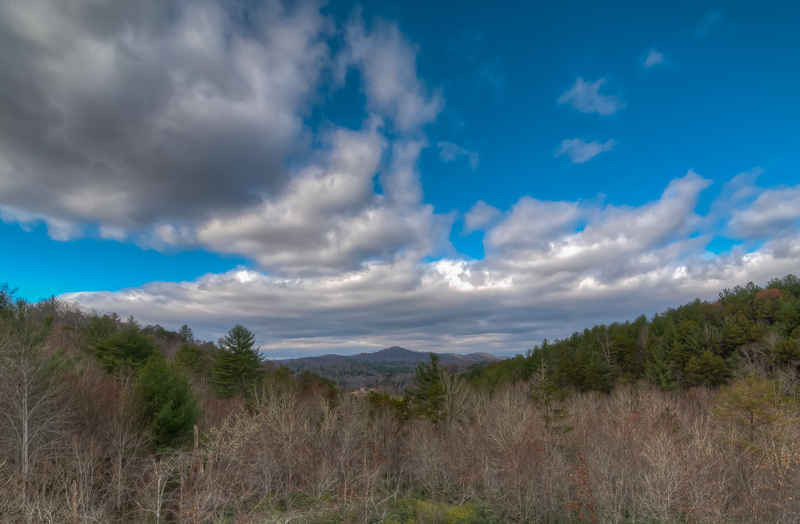 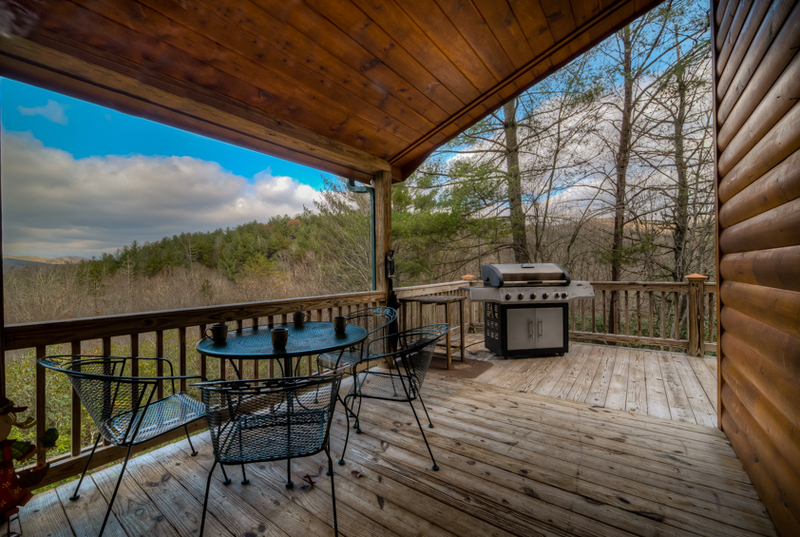 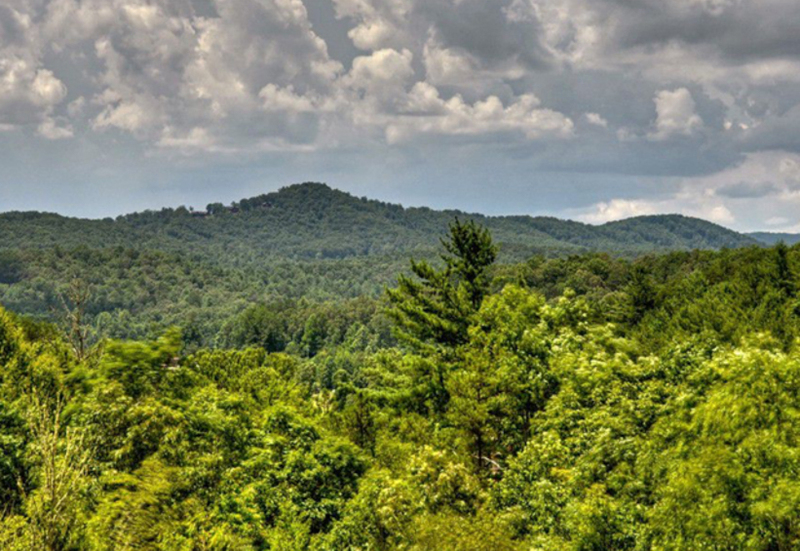 Located in Mineral Bluff, this private wooded oasis is just 20 minutes from the restaurants, pubs and shopping of downtown Blue Ridge and just a few miles from popular Lake Blue Ridge and Toccoa River fishing and boating spots. 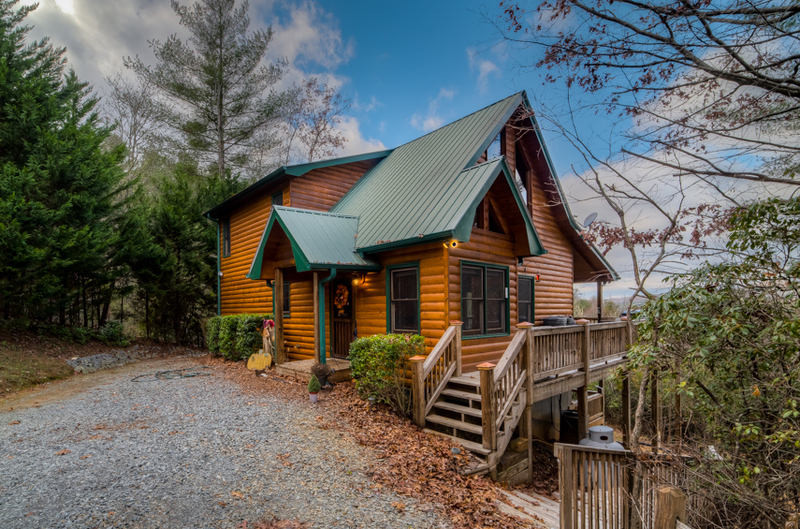 With a handsome green roof and trim that matches the surrounding greenery, the cabin’s exterior is handsomely designed, and its all-wood interior is an eye-pleasing blend of modern, rustic, and elegant design. 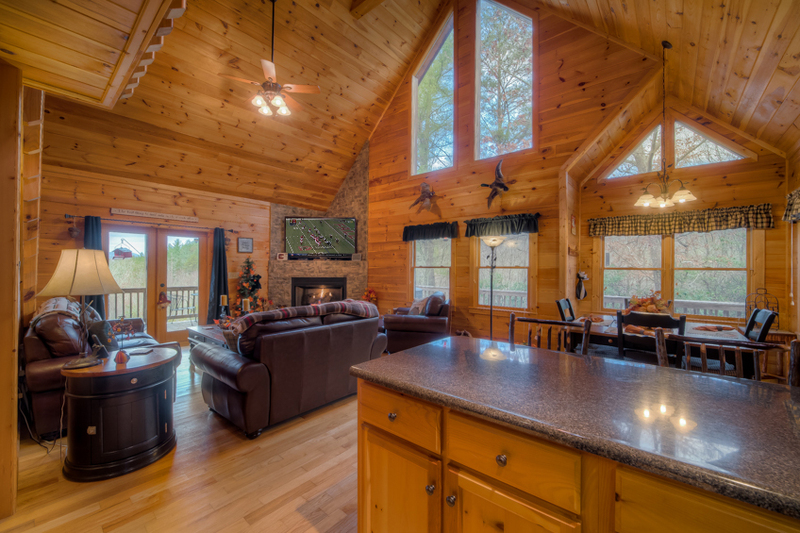 The high ceilings and huge windows give it the wow factor, and the cozy ambiance and tasteful décor make it a warm and welcoming home away from home. 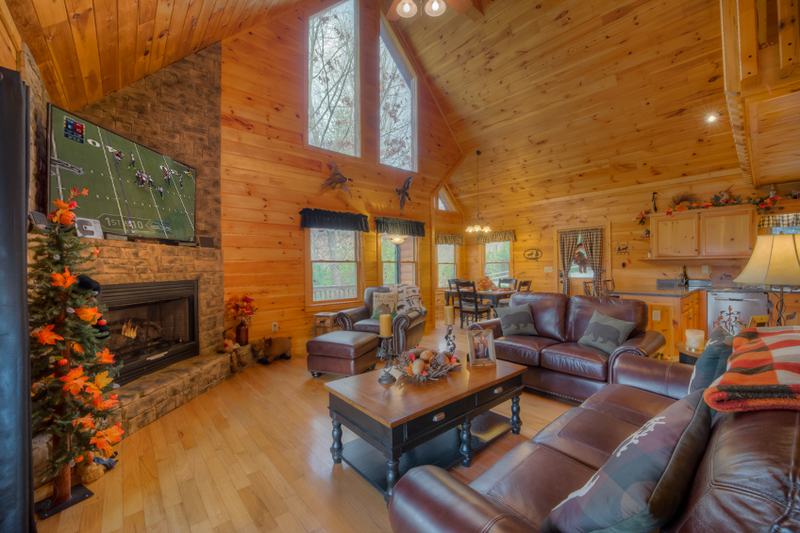 On the main level, comfortable leather furniture, a gas fireplace, and a DVD-equipped 70” TV in the living room invite you to gather and relax, and the fully-stocked kitchen offers everything you need to prepare, cook and serve. 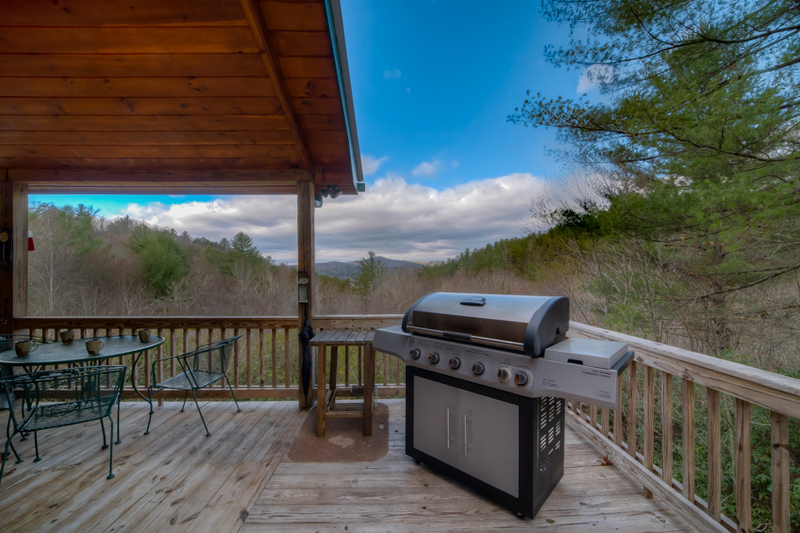 It features custom wood cabinets, black electric appliances, a crockpot, drip coffeemaker, a table for six and island counter seating for two. 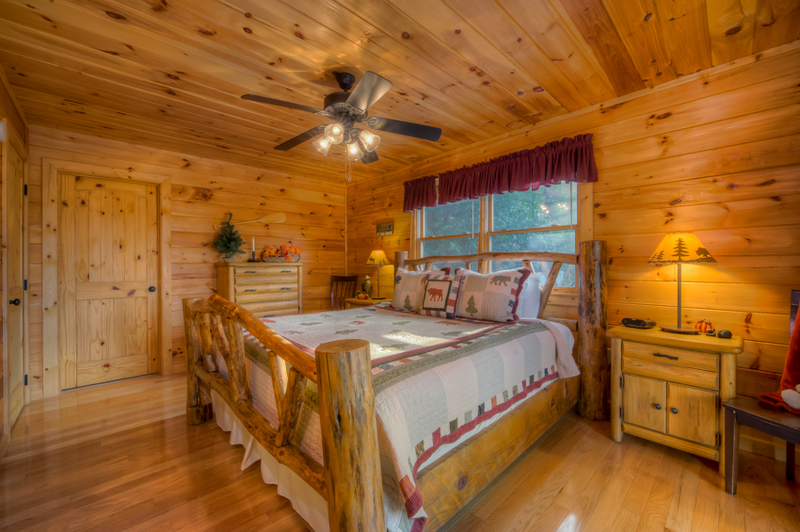 There are three spacious, comfortable bedrooms, each with a lovely quilt and private bathroom. 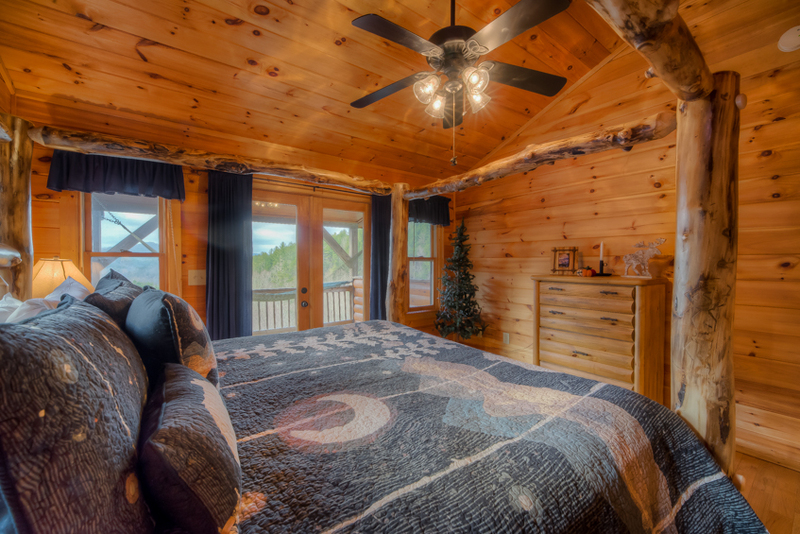 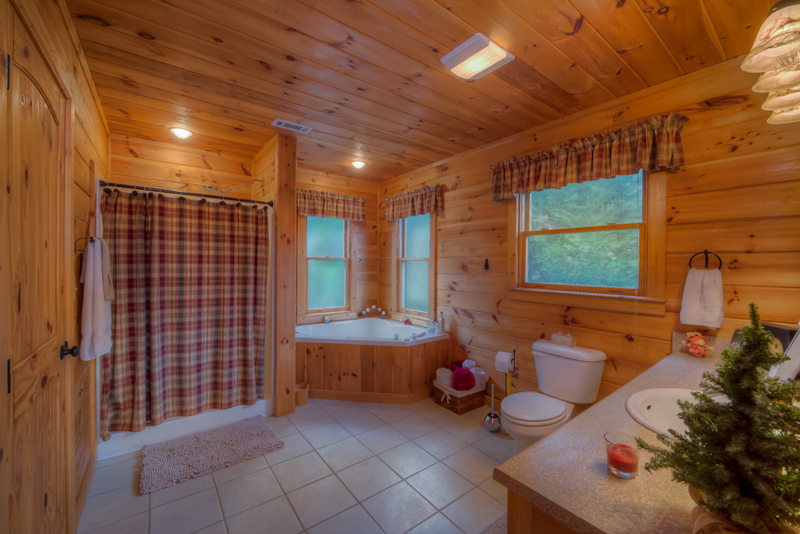 The upstairs master has a king log bed, private porch with a hammock, a walk-in closet, and a Jacuzzi tub and walk-in shower in the bath. 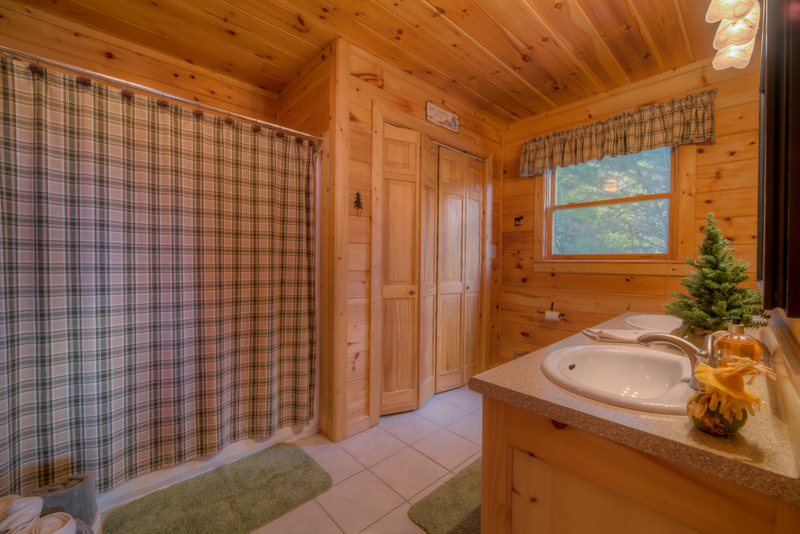 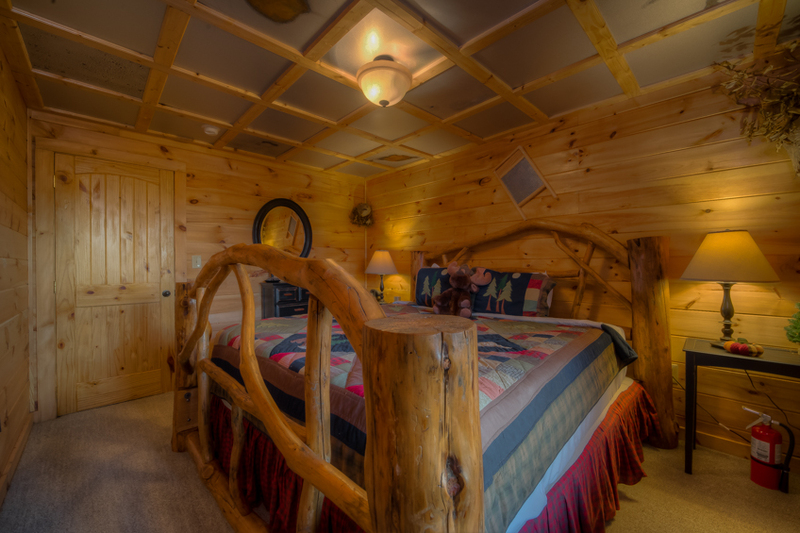 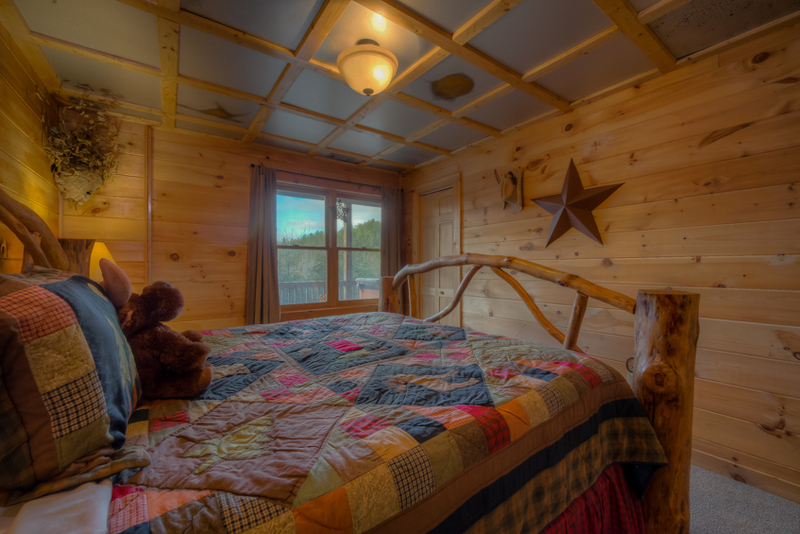 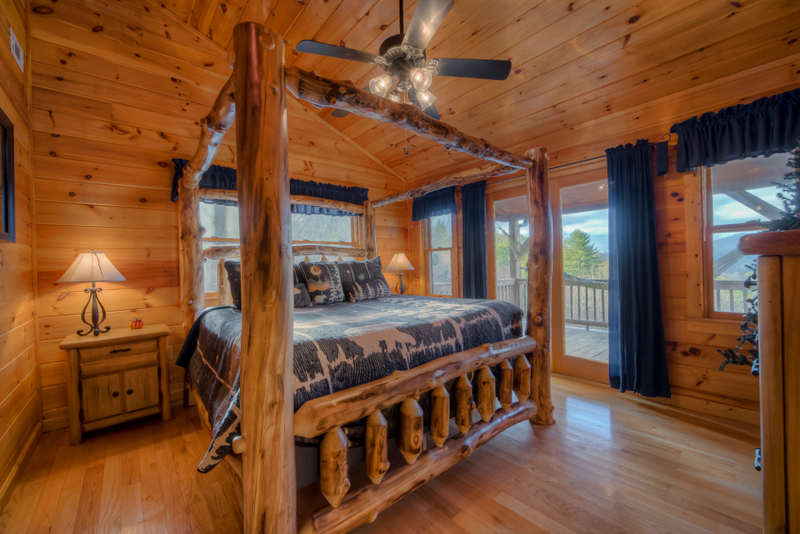 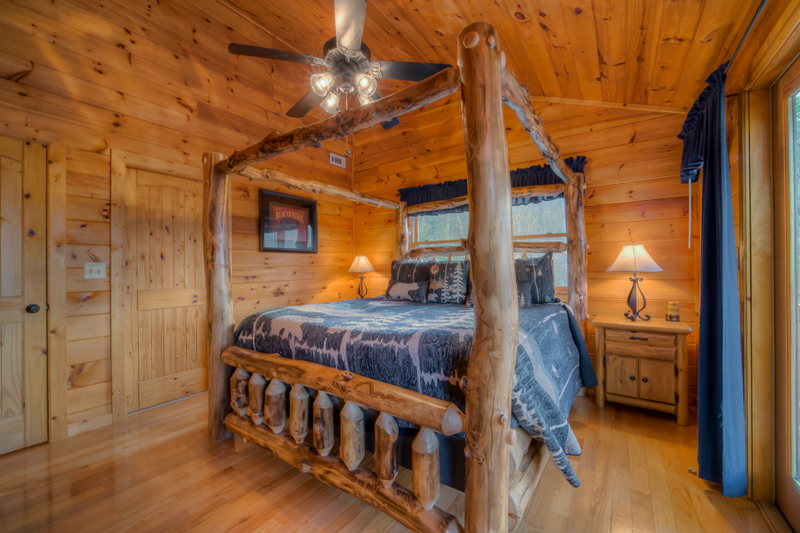 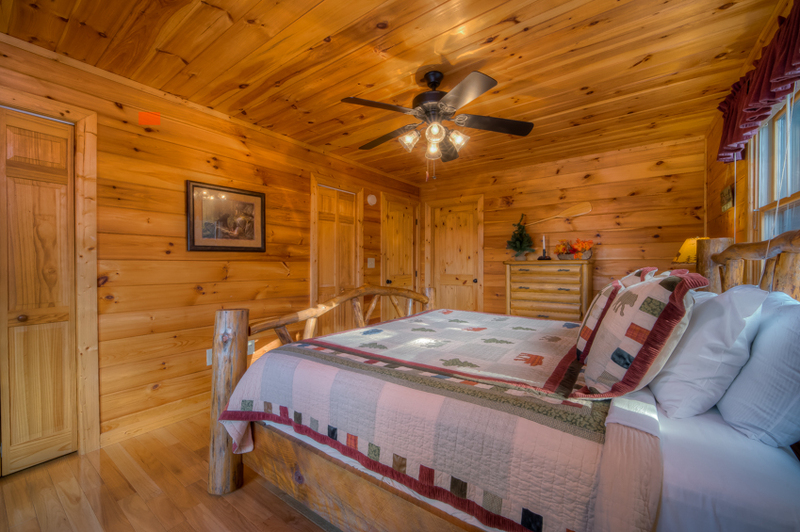 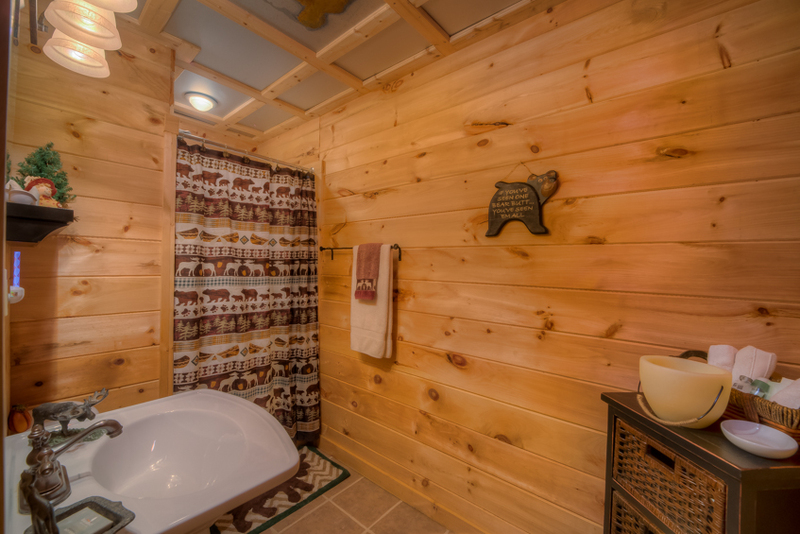 The main level bedroom has a king log bed, deck access, and a bathroom vanity with double sinks, shower/tub and washer/dryer. 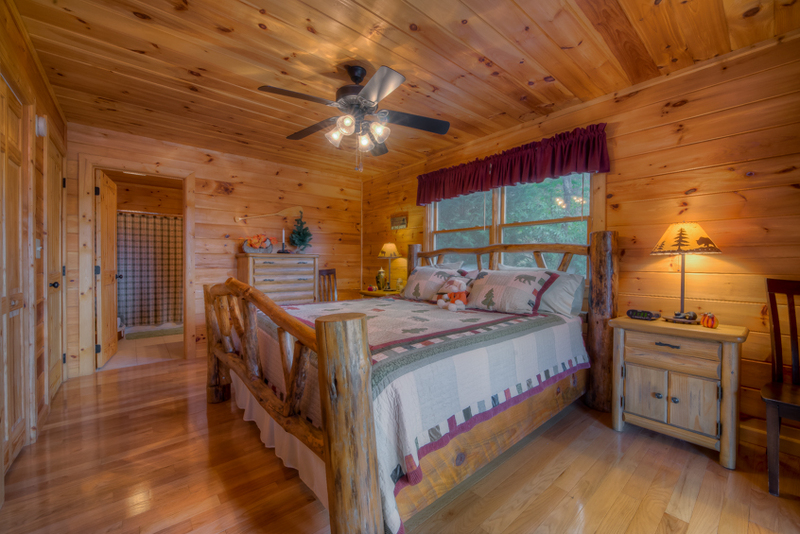 The downstairs bedroom features a king bed, deck access, and a walk-in shower in the bathroom. 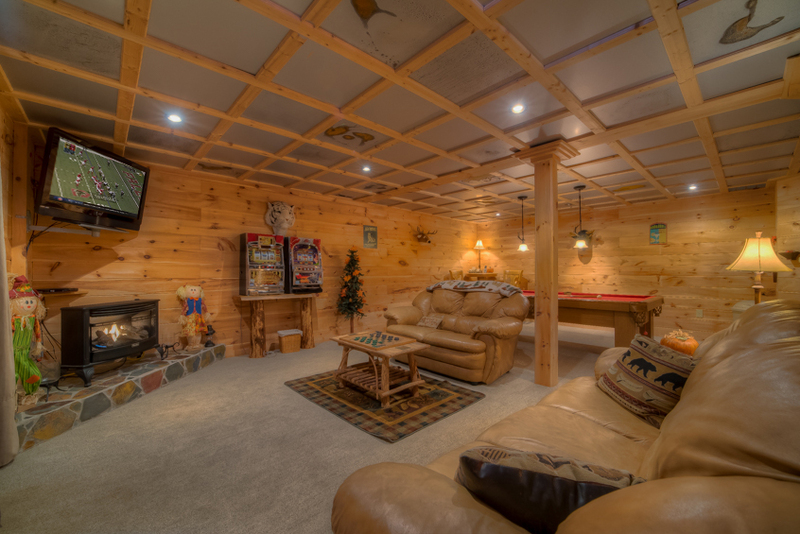 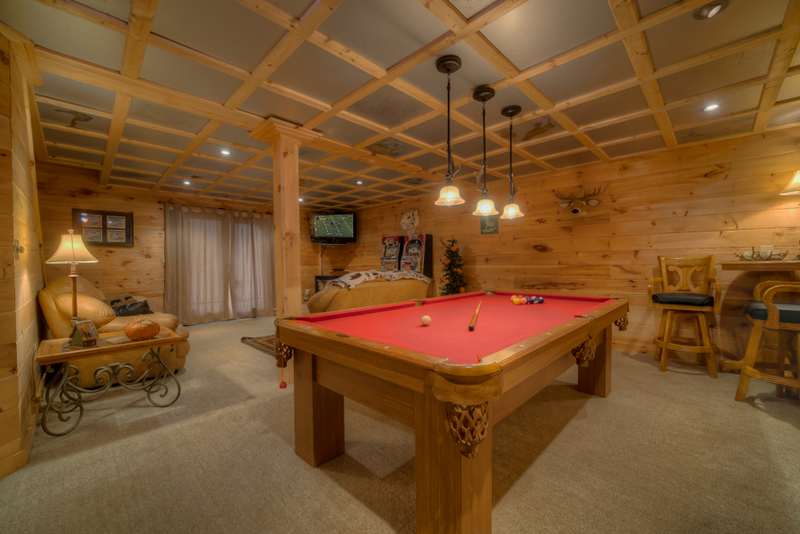 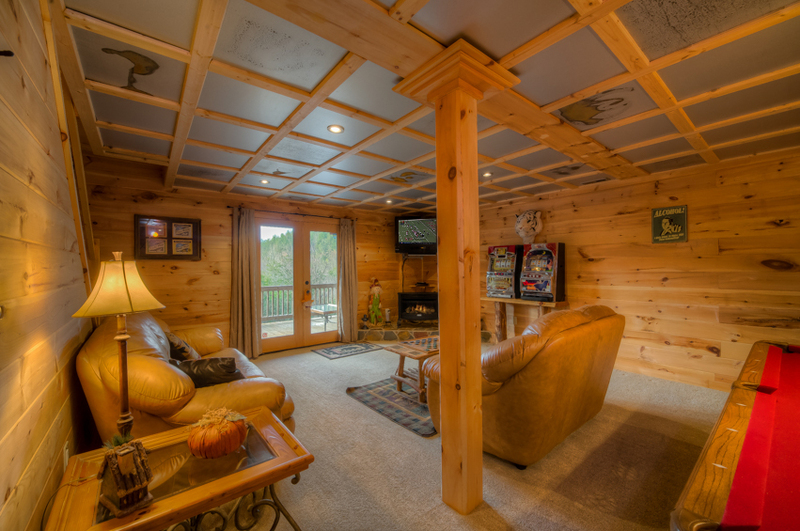 The cabin is designed for both indoor and outdoor fun, depending on your mood and the weather. 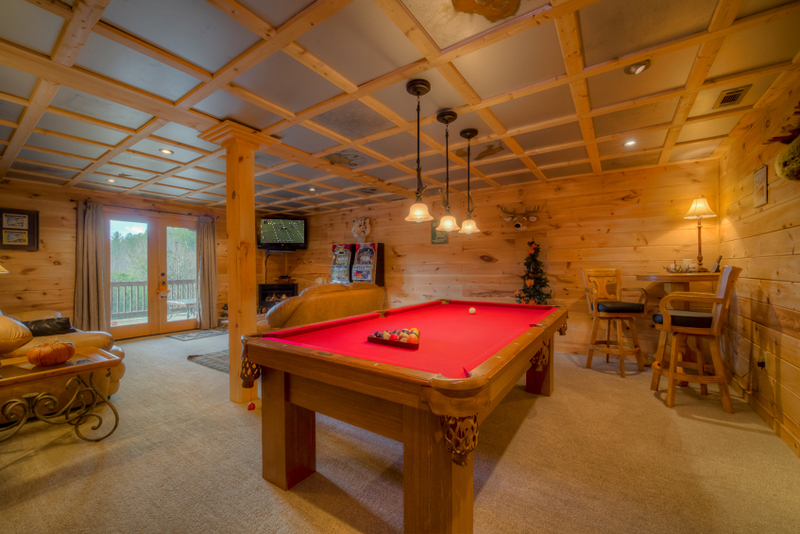 The game room on the lower level has a billiards table, dartboards, board games, non-gambling slot machines, and a 50” TV with a wireless speaker to keep you entertained. 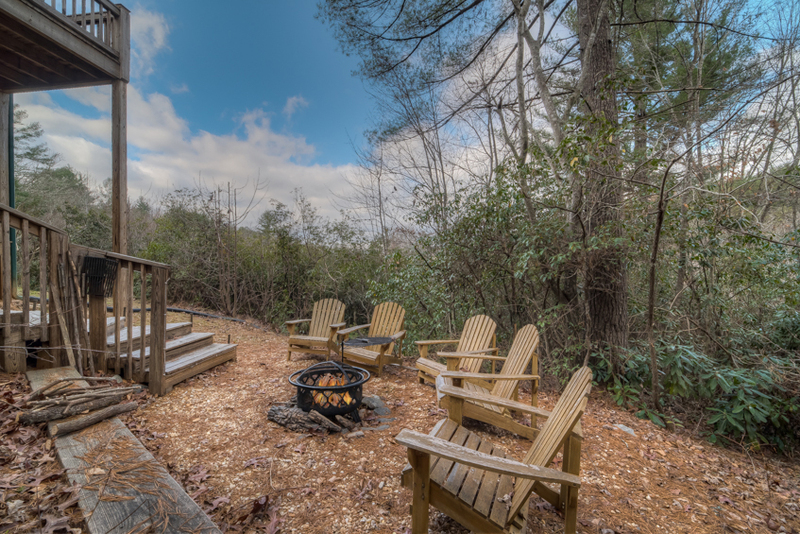 Outside, you’ll find a six-seat hot tub, porch swing, rocking chairs, a 4 person dining table, and a gas grill and ice chest for dining alfresco and a fire pit with a charcoal grill built-in to make s’mores and more. 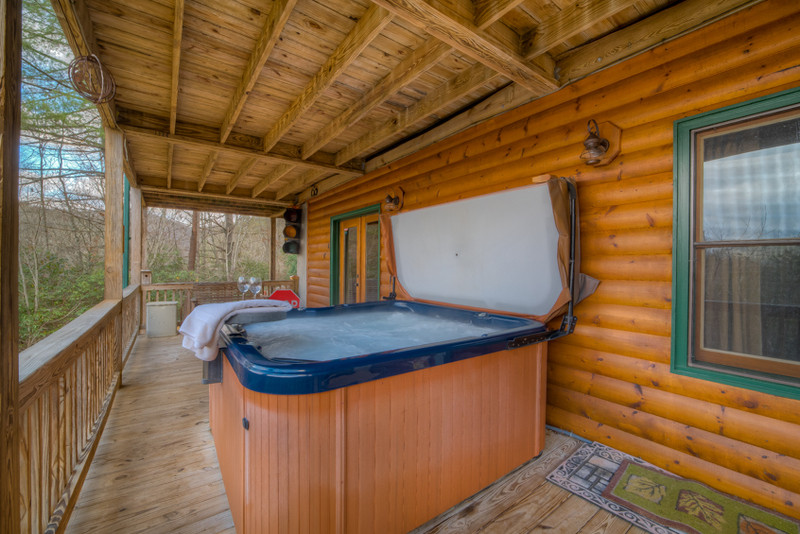 What else do you need to know? 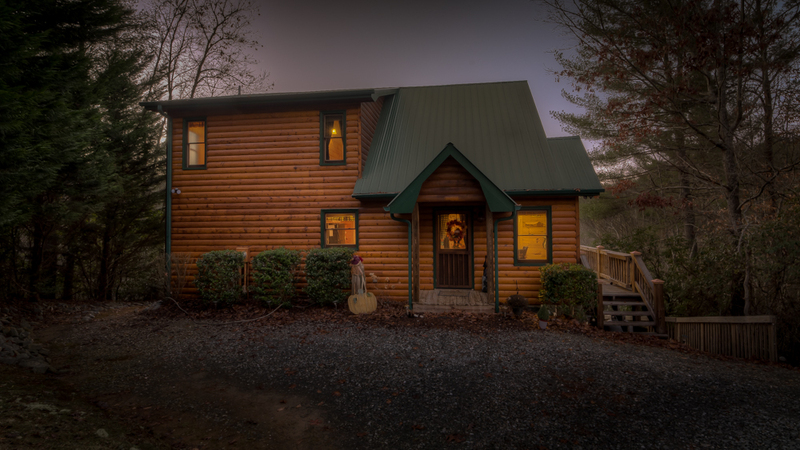 Harvest Moon has wifi, DISH Network, and a gravel driveway. 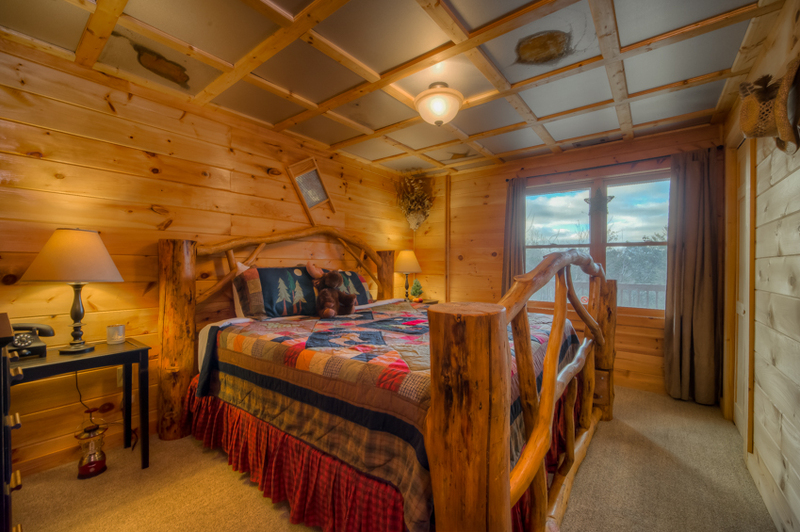 It’s also pet-friendly, so you can bring your furry friends along to enjoy a special vacation that you and your family will talk about for years to come. 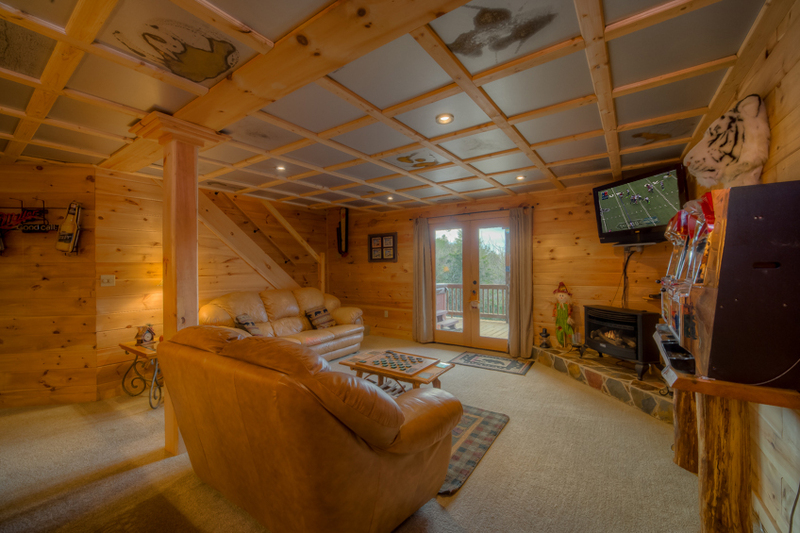 02/19 - Spacious, very comfortable, we liked the house a lot.